『여주이씨 옥산문중 유묵 - 해동명적(驪州李氏 玉山門中 遺墨 - 海東名蹟)』은 조선 중종 때의 문신인 신공제(1469∼1536) 선생이 우리나라 역대 명필의 글씨가 돌에 새겨 있는 것을 탁본하여 상하 2책으로 묶은 것이다. 상권에는 조선시대 문종과 성종의 어필을 앞에 따로 놓고 다음에 신라시대 최치원, 김생, 영업의 3인과 고려시대 탄연, 이암, 신덕린 등의 3인을 합한 6인의 글씨를 모아 놓았다. 하권에는 이강, 승려 혜근, 성석린, 박초, 권근, 이첨, 정도전, 정총, 민자복, 신색 등 12인의 글씨가 실려 있다. 이 책은 탁본이라 하더라도 고대의 서법을 연구하는데 중요한 자료가 된다. 또한 비문에 나타나지 않은 필적을 많이 수집하였다는 점에서 의의가 있다. 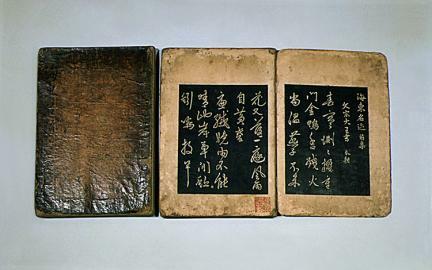 This two-volume collection is composed of rubbings of Korean master calligraphers’ stone inscriptions made by Sin Gong-je (1469-1536), a government official who served during the reign of King Jungjong of Joseon. The first volume starts with the calligraphic works by King Munjong and King Seongjong, followed by three calligraphers of Silla (Choe Chi-won, Kim Saeng, and Yeong Eop) and three masters of Goryeo (Tan Yeon, Yi Am, and Sin Deok-rin). The second volume features works by twelve calligraphers including Yi Gang, monk Hyegeun, Seong Seok-rin, Bak Cho, Gwon Geun, Yi Cheom, Jeong Do-jeon, Jeong Chong, Min Ja-bok, and Sin Saek. Despite being a collection of rubbings, this book is an important document for the research on ancient calligraphic styles. Another thing that makes it meaningful is that it includes numerous texts that do not appear in epitaphs.